This post was contributed by Meggie Wright, OER Librarian, Lane Community College. In January 2017, the LCC Library welcomed Meggie Wright, our new Open Educational Resources (OER) Librarian. The OER Librarian position is a new, two-year, grant-funded position that will strengthen the existing OER program. Meggie’s work will focus on increasing faculty use of OER within their courses and developing faculty and student knowledge of open pedagogy practices at Lane. Based on data models used by Linn Benton Community College, we are trialling a new method for calculating our potential student savings. Previously we relied on calculating savings with average figures for class size and textbook costs. We have started using actual class enrollment numbers and prices of new textbooks from the Titan store (when these figures are available). This method represents the prices that students are faced with when purchasing new, traditional textbooks. Using the new method, we calculate that Lane students will potentially save up to $273,063 for Winter 2017 through use of OER! Lane is changing how we offer grants and stipends to support faculty use of OER. While we had great success with the Faculty Fellowship model, there was a natural curve of attrition after the early adopters went through the program. We are pleased to see a resurgence of interest from faculty with the new model. Approximately $40,000 has been granted to faculty so far and we will give out another round of awards to faculty this summer for adopting OER in their 2017-18 classes. We have seen good success; Lane currently offers OER/low-cost classes in over 20 subjects. To see which courses have been converted, visit the list of OER adoptions at Lane on the Open Oregon Resources page. Lane’s OER support staff Victoria Koldewyn has developed a student-focused media campaign (check out her poster in the photo of Meggie, above). We will be partnering with Academic Advising and other groups on campus to increase awareness of OER among our student body. 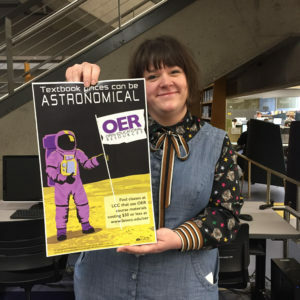 These images are available for others to adapt and use via Out-of-this-world OER Marketing Campaign.